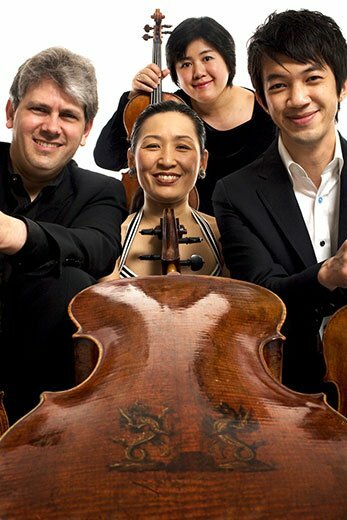 When an ensemble has a reputation and history like those of the Borromeo String Quartet, you expect something out of the ordinary. That’s what we got at the ensemble’s Maverick concert on Sunday. Although the program also included works by Schuller and Beethoven, perhaps the most unusual and striking performance was that of Haydn’s Quartet in F, Op. 77, No. 2. The BSQ consistently plays with an urbane sound and all the expected virtues of fine ensemble and balance. Yet it was the red-blooded, impulsive quality of this interpretation that made it so compelling. You could tell how affecting these performers found the music not only from the way they sounded but also from the way they were constantly exchanging looks of pleasure and excitement and even the way a couple of members were stamping as well as playing their accents. This performance was gratifyingly responsive to Haydn’s surprises and humor, and in his magnificent last completed quartet we could hear the lessons, wisdom, and feeling of a lifetime’s creativity. At intermission I heard some audience members talking about how they had never realized that Haydn’s music was that great. Well, I have, but this performance was a wonderful reminder. Gunther Schuller was well known for his “third stream” music (a term he invented), melding the idioms of classical music and jazz. But his String Quartet No. 4, relatively late music from 2002, seems to have no jazz influence at all. It sounds more like what Bartók might have written had he lived longer, with the rhythmic vitality of that composer’s music but denser harmonies and further departure from tonality. The first movement particularly reminded me of Bartók’s “night music” style. I would consider this relatively “difficult” music, especially on first exposure (which it wasn’t, for me) but the very cohesive performance put it over and won the audience’s rapt attention and enthusiastic applause. We’ve long since run out of superlatives for Beethoven’s late string quartets, but a performance with a fresh approach can still be startling and new. The Borromeos’ playing of the Quartet in A Minor, Op. 132, made the familiar music come vividly to life. I noticed particularly the stomping rhythms (literally as well as figuratively) in the second movement, and the otherworldly quality of the slow sections of the third. In that context, the brief fourth movement came across as comic relief, quite likely what Beethoven intended. A memorable conclusion to a superlative concert.